To brush off the blues of winter, many plan on taking a trip in March. 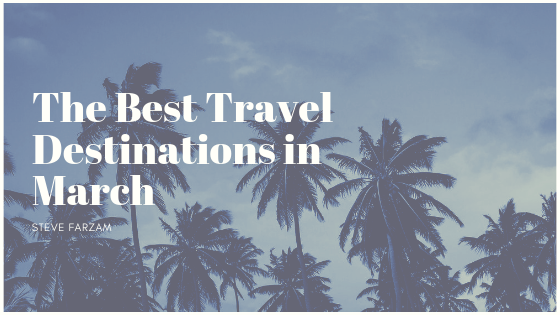 There are numerous ideal destinations in the United States and around the world that you might consider. Spectacular locations and exciting activities await. Key West is the ideal location when desiring to take a trip to the tropics without leaving the states. The island encompasses approximately six square miles, which makes the destination easy to navigate and explore. Come March, the snowbirds are gone, and most prices are lower. Go snorkeling, scuba diving or join a glass bottom boat tour of the Florida Keys National Marine Sanctuary, which is the third-largest coral reef on the planet. Be amazed by the fascinating underwater world that includes colorful tropical fish and a variety of vegetation. With more than 200 cafes and restaurants, there is no lack of dining options. Travelers often venture to this famous city to catch the end of the Mardi Gras celebrations. The festival dates back to 1699. Fat Tuesday is the official holiday, which is celebrated during the first week in March. But, parades and other festivities take place weeks in advance. Indulge in a streetcar tour of the city. Tour an authentic plantation. Make a point of visiting the French Quarter, which is the oldest part of the city. Shop in the boutiques and enjoy the music that permeates the air. Maybe embark on a riverboat ride or tour one of the many museums. This historic city attracts chocolate lovers and ale drinkers. During March, the nearby city of Antwerp hosts the annual Chocolate Week. However, Brussels has the Neuhaus Chocolate Shop. The facility has a 160-year history of creating the delectable delights. See the workers creating the confections at the Atelier de Neuhaus’, which is in the Queen’s Gallery. The Belgian Chocolate Village is a museum dedicated solely to the mouth-watering delight. Visitors learn about the history of chocolate. Witness the care taken to produce the cacao beans. See artisans at work and indulge in a taste. Beer drinkers make a point of touring the Schaerbeek museum of beer. Learn the amazing history of the drink. See the historic equipment used to create beer. There is also an extensive collection of beer bottles, glasses, and mugs. End the tour with a sampling session.